Hello there and welcome! 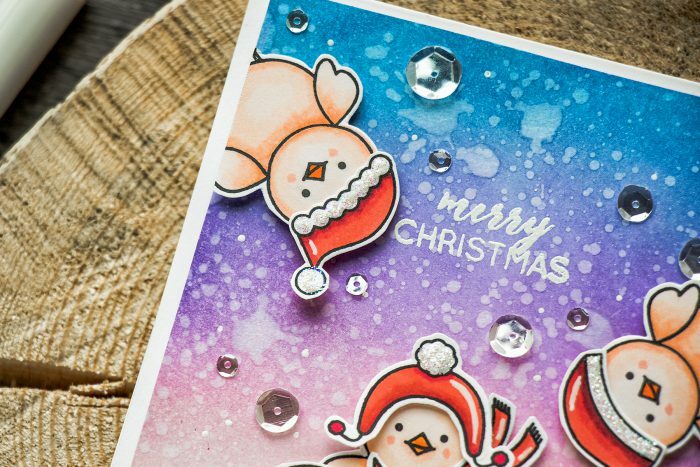 Today I’d like to share a card I created using STAMPtember Pretty Pink Posh exclusive stamp set – Winter Bird Friend! I’ve been wanting to create a card like this one inspired by Melania Deasy for a long time! 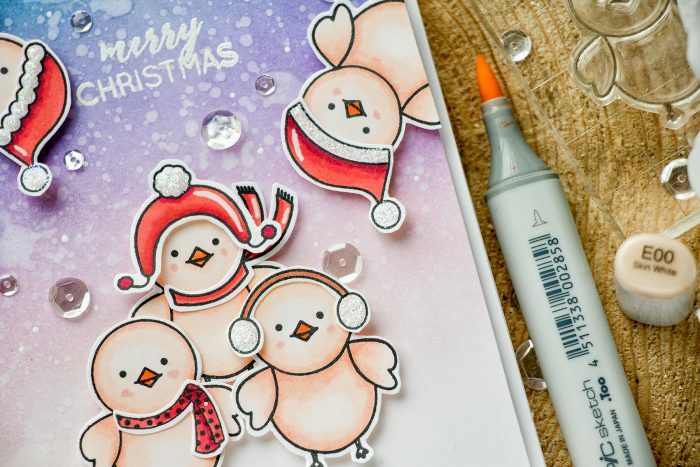 I started by stamping the little bird image 5 times onto Copic X-Press It paper and coloring with my Copic markers. I don’t have a good selection of yellow colors so I used colors from the E family – skin colors. My hubby said I colored penguins and not birds, lol! Do these look like penguins to you? I also stamped a few different accessories and colored them using reds. 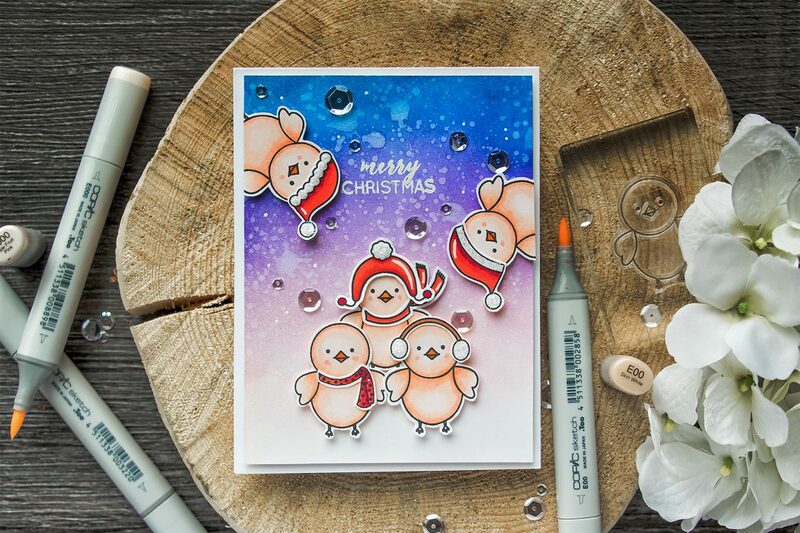 I used Simon’s Intense Black ink for stamping as it is a Copic friendly ink and doesn’t bleed when it comes in contact with alcohol markers. For my background I used Simon’s 120 Heavy White cardstock (I love this paper!) and blended several colors of Distress inks (I’m listing colors at the end of my post). I added drops of water using my Distress Sprayer and drew in some dots using white pen. My panel was trimmed to 4 by 5 1/4 inches and was foam mounted onto an A2 top folding card base. I also added a bunch of Sparkling Clear sequins from Pretty Pink Posh – they go well with everything! 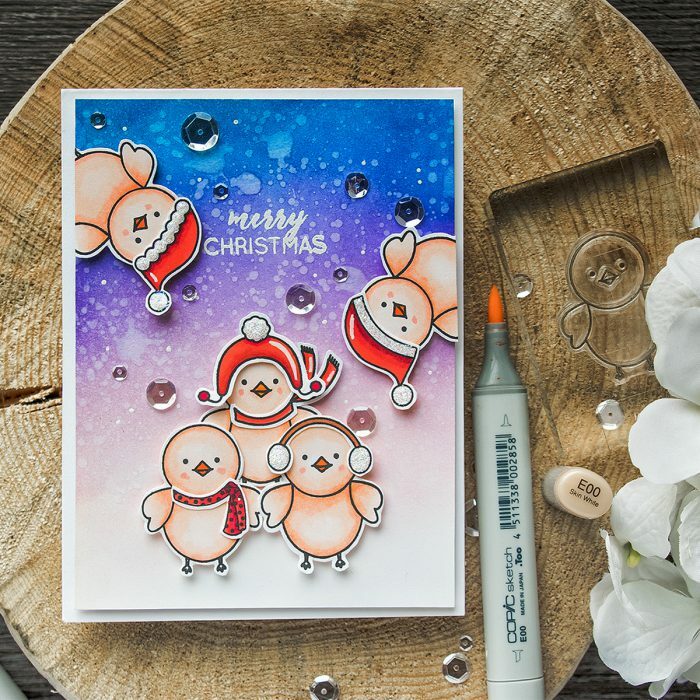 Really cute card, love how you spread the joy with all the chicks! 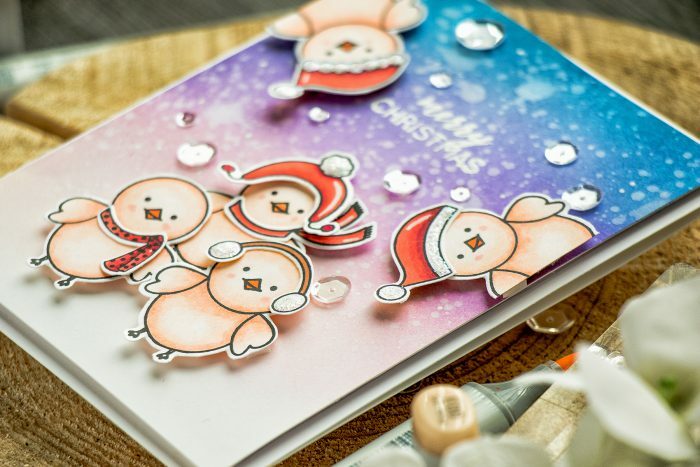 Love your card, and the birds don’t look like penguins (men! ), they’re adorable ! I know! lol! thank you! Oh my goodness Yana, this is just way too cute! I just can’t! These chicks are so cute!! Amazing background and great coloring. So lovely! definitely not penguins, but men are men 🙂 thanks!